Still trying to figure out what to serve your party guests this holiday season? MORE owner, Patty Rothman, was on WGN TV's "Lunchbreak" today with a special cupcake recipe that's sure to please. Rothman helped WGN reporter Dina Bair prepare MORE's new Margarita Cupcake and gave her tips on perfecting her frosting technique. On hand were several of MORE's other flavors, including their signature "MORE" cupcake, a moist chocolate cake with a housemade marshmallow filling (a guaranteed show-stopper). Want to steal the show at your next party? Check out MORE's Margarita cupcake recipe here. MORE's cupcakes range from $3.50-$4.25 each, or $39.50-$49.50/dozen. MORE also offers flights of six MOREsels, including the new Cocktail Flight and Sunday Morning Flight, which make perfect hostess gifts. Call MORE at (312) 951-0001 to place your holiday order today! Just in time for the holidays, A Silver Lining Foundation's new online store is open for business. Holiday shoppers rejoice! Looking for clothes? ASLF's popular "Save the Girls" t-shirt can now be purchased online. The tee comes in two colors and a variety of sizes. Need some bling? ASLF has jewelry-lovers covered, with its signature spiral logo featured on two varieties of necklace: there's the sterling silver version, and the timeless diamond version. And don't forget the holiday tunes. The ASLF store also offers autographed copies of Chicago's own Ron Hawking's holiday CD, "Christmas." Visit Ron Hawking's web site here: http://www.ronhawking.com/. Visit ASLF's online store here: https://www.asilverliningfoundation.org/store/index.php. All proceeds from the store support The Buy A Mom A Mammogram program, and other ASLF programs. For more information on ASLF, visit http://www.asilverliningfoundation.org/. 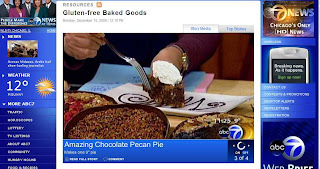 In case you missed it, Deerfields Bakery's own gluten-free baker, Lisa Albertson, appeared on WLS-TV this morning to prepare holiday gluten-free treats. With the help of anchors Linda Yu and Judy Hsu, she demonstrated how to make her gluten-free Chocolate Pecan Pie, just in time for the holidays. Deerfields not only offers its gluten-free pies for the holidays, but also has gluten-free brownies, cookies, cheesecakes, and even gluten-free stuffing cubes! 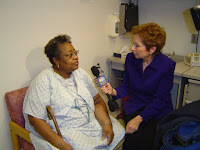 To view the segment online, press here: http://abclocal.go.com/wls/story?section=resources&id=6556225. For more information on Deerfields' gluten-free line, visit http://www.deerfieldsglutenfree.com/. Congratulations to our friends well as to all others featured. We’ve dined at many of these restaurants and can vouch for Heather’s and David’s good taste. Here's what they had to say about our clients. Bon appétit during the Holiday Season and throughout 2009! For our friends visiting Chicago over the holidays, be sure to check out these places! MORE's unique sweet and savory cupcakes have made a big impression this year, both with consumers and the media. Today, ABC 7's Hungry Hound, Steve Dolinsky included MORE's cupcakes as part of his "Favorite Sweets of 2008." On-hand for the segment were MORE's Coconut Mango and signature "MORE" cupcakes. After tasting the MORE, much like a Hostess cake, anchor Sylvia Perez said, "MORE, I understand the name, th is is better than any Ho Ho I've ever had!" Watch the whole segment, here. Plus, Time Out Chicago's lastest issue named MORE's well-known BLT Cupcake as part of its "100 Best Things We Ate This Year." Check out the entire list of Heather Shouse and David Tamarkin's favorites here. Finally, Erich "Mancow" Muller raved about MORE's Margarita and BLT cupcakes on his WLS-AM radio this this morning. Word is, he's planning to bring them to his next party! Want to see what all the buzz is about? Check out MORE at 1 E. Delaware Pl. in Chicago's Gold Coast. Call (312) 951-0001 to place your order. Chicago's chic cupcake boutique, MORE, (1 E. Delaware Pl., 312-951-0001) known for its creative sweet and savory cupcakes, has introduced several new flavors to “Give MORE” this holiday season. MORE's cupcakes are truly the ultimate gift: gorgeous, decadent and delicious. Treat that special someone to more with cupcakes in new holiday flavors like Chocolate Hazelnut, Gingerbread or White Chocolate Peppermint. Cupcakes range from $3.50 to $4.25/each, or $39.50 to $49.50/dozen. 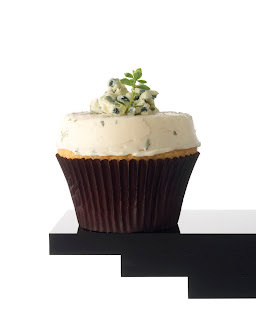 Holiday party-goers should know that MORE’s cupcake flights make the perfect hostess gift or party favor. Everyone will buzz about the new Wine and Cheese Flight with flavors like Apple Gorgonzola; Champagne Brie; Camembert Sauternes; and Pear, Blue Cheese and Port (pictured). MORE also has a special Holiday Flight featuring cupcakes in familiar flavors like Gingerbread, Chocolate Mint, White Chocolate Peppermint and Red Velvet. Toast the New Year with cupcakes! MORE’s new Champagne Flight bubbles over with cupcake flavors like Bellini, Mimosa and Kir Royale. MORE has also introduced a Cocktail Flight, perfect for those late night and weekend soirees. Try assorted cocktail flavored cupcakes including Margarita, Pina Colada, Mojito and Martini. Need a “pick-me-up” after a fun-filled weekend? MORE’s Sunday Morning Flight does just the trick with Bloody Mary cupcakes topped with an assorted variety of garnishes. All flights include six of MORE’s signature MOREsel cupcakes, and range from $9.50 to $11.50 each. To make the perfect holiday party appetizer or dessert, MOREsels are also available by special pre-order in sets of 16 or 30. Please note orders require a minimum of 48-hours notice. To place an order for cupcakes, please contact MORE at (312) 951-0001. It’s the holiday season, and there’s no better place to celebrate than in the rustic, fireside ambience of Birch River Grill. The restaurant’s special holiday menu is delicious, and at $38.95 per person, a deal. The children’s menu is available for children ages five through 12 and is $12.95 per child. This holiday menu is offered December 25 from noon until 10 p.m. For starters, enjoy Yukon Gold Potato and Charred Leek Chowder, with peppered bacon garnish; and Tossed Winter Greens, toasted pecans, a brie cheese wedge and citrus zest vinaigrette. Choose one of the following as an entrée: Creole Mustard Glazed Salmon, with radicchio, Brussels sprout and fennel ragout, and cheddar cheese grits; Roast Turkey with Chestnut Brioche Stuffing, sweet potato crush and green beans with cranberry relish; or Roast Prime Rib of Beef, with horseradish cream, Red Bliss potato rosti and lemon broccoli crown. At the end of the meal, enjoy Chocolate and Orange Truffle Mousse, orange scented chocolate mousse, chocolate bark, gold dusted chocolate leaf and blood orange drizzle. Ring in the New Year at Birch River Grill and sample fantastic specials from the rustic eatery in addition to their regular menu. Birch River Grill will be open on December 31 from 6 a.m. until 10 p.m. Enjoy Rock Shrimp Bisque, with cucumber and lime zest garnish ($8), or the Herb Crusted Tuna Loin, served with Winter Squash and Caper Relish, and Scallion Citrus Cream ($13). Indulge in the Surf and Turf special, featuring Filet Mignon, with Horseradish Butter, Sweet Potato Crush, Hazelnut Butter Brussels Sprouts and Jumbo Shrimp, with a Roasted Fennel Ragout, Blood Orange Cream, and Micro Greens with Citrus ($38). Toast to the holidays with one of Birch River Grill’s decadent drinks. Try to resist the Nutty Irishman, a mix of Frangelico Hazelnut Liqueur, Bailey’s Irish Cream, and Cream. The Irish Cappuccino features a Bailey’s Irish Cream kicked-up Cappuccino while the Captain’s Spiced Cider heats up tart apple cider with Captain Morgan’s Spiced Rum. For those with a sweet tooth, the Peppermint Twist is hard to miss, featuring Peppermint Schnapps, Kahlua, and Crème de Cacao. Other desserts in a drink are the Winter Eggnog, Brandy, hot milk, and eggnog, and the Cinnamon Roll, featuring Cinnamon Schnapps and hot apple cider. All Winter Warmers at Birch River Grill are $7. Birch River Grill’s regular menu will offered in addition to the holiday menus. Birch River Grill – An American Kitchen is open for breakfast, lunch and dinner seven days a week, from 6 a.m. to 10 p.m. Monday through Thursday; 6 a.m. to 11 p.m. Friday; 7 a.m. to 11 p.m. Saturday; and 7 a.m. to 10 p.m. Sunday. The lounge stays open one hour later daily. All major credit cards are accepted. Complimentary parking is available. For reservations or more information, please contact Birch River Grill – An American Kitchen at (847) 427-4242 or visit them on the web at http://www.birchrivergrill.com/. 733 W. Madison St, Chicago, Ill. Celebrate the holidays with family and friends at the West Loop’s chic, retro-themed eatery, Dine. From noon until 9 p.m. December 24 and 25, enjoy the special holiday menu at $34.99 per person, $16.95 per child 12 and under. For starters, enjoy Winter Green Salad, buckwheat honey roasted Bosc pear, caramelized buttercup squash, and cider vinaigrette. The entrée is Roast Prime Rib of Beef, with grilled asparagus, cabernet jus, and pommes dauphinoise. Indulge in Ricotta Cheesecake, Bing cherry sorbet and compote for dessert. Christmas dinner at Dine can also be prepared for take out. From 6 p.m. until 2 a.m. on December 31, Dine presents a special three-course pre-fixe New Year’s Eve menu to ring in the New Year. For $55 per person, enjoy a starter, entrée and dessert. Choose between Spice Rubbed Prime Tenderloin, golden beet vinaigrette, Brussels sprout-horseradish salad; or Pan Seared Maryland Blue Crab Cakes, baby arugula salad and roasted garlic aioli, for starters. For the main course, choose between Grilled 8 oz. Filet Mignon, fingerling potatoes, glazed cipollini onions and natural jus; Roasted Amish Chicken Breast, thyme roasted turnips, melted leeks and natural jus; or Grilled Norwegian Salmon, warm fingerling potato salad, Dijon crème fraiche and chive oil. Tempt the sweet tooth with Ricotta Cheesecake, Bing cherry-zinfandel gelato and sauce, or Peanut Butter-Milk Chocolate Marquis, roasted banana semifreddo and peanut brittle. Dine’s classic cocktails (each signature cocktail, $11), made with artisan ingredients, are perfect to enjoy during the holiday season. Try the Peppermint Martini, made with Kettle One Vodka, Crème de Menthe, Peppermint Schnapps, and rimmed with crushed candy cane. The Apple Pie Martini is dessert in a drink, featuring Grey Goose Vanilla Vodka, Brandy and Dry Vermouth, with a baked apple garnish. Sip the Red Velvet and taste Belvedere, sour cherry puree, Crème de Cacao, Strawberry Pucker and Cranberry. For chocolate lovers, try the White Chocolate, made with Chopin, Godiva White Chocolate Liqueur, Crème de Cacao, Fresh Cream and dusted with cocoa. For those who savor a tart treat, enjoy the Key Lime, Stoli, Licor 43, key lime juice, fresh cream and a graham cracker rim. The Cranberry Martini, made with Chopin Vodka, Godiva Liquor, Cranberry Juice, and cranberry sauce and is topped off with champagne. Enjoy the Pomegranate Cosmo, a seasonal twist on the classic cosmopolitan, featuring Absolut Citron, Orange and Pomegrante Liquor with a Lemon Twist. The Classic is a favorite traditional martini, Grey Goose, shaken and poured into a chilled martini glass, served up with bleu cheese olives or a lemon twist. Also on the cocktail list is The Elite ($15), Premium Roberto Cavalli Vodka or Tanqueray 10 Gin, shaken and served up with olives or a lemon twist. Glen Prairie Local Flavor Fine Food & Drink honors local farm and produce sources throughout the year, and with their seasonal Holiday specials, they invite the public to celebrate the importance of being environmentally conscious. The holiday specials will be offered from noon until 9 p.m. on December 24 and December 25. For starters enjoy the Roasted Winter Squash Bisque ($5) and then partake in the entrée special, a Pesto Rubbed Prime Rib of Beef Au Jus, with baked potato and roasted carrots, ($27). The Christmas Eve and Christmas Day specials are offered in addition to the regular Glen Prairie menu. New Year’s Eve at Glen Prairie brings in fantastic specials from noon until 10 p.m. in the restaurant, and until 1 a.m. in the lounge on December 31. Indulge in the rustic Roasted Winter Squash Bisque ($5) for starters and then raise a glass of green farmed sparkling wine to toast the arrival of the New Year, complimentary with the order of a New Year’s Eve entrée special, available for purchase without entrée special. Enjoy Grilled Lake Sturgeon, with lemon and roasted shallot brown butter, fried capers, wild rice pilaf and caramelized parsnips ($31) or the Dietzler Farms Beef Tenderloin Roulade, with roasted red peppers, wilted spinach, Mindori bleu cheese, green peppercorn demi, potato gratin and charred artichoke hearts ($36). The New Year’s Eve specials are offered in addition to the regular Glen Prairie Menu. To keep you warm and jolly during the holidays, Glen Prairie has many special cocktails available. Delight in the Peppermint Patty, White Crème de Menthe, Peppermint Schnapps, Godiva Dark Chocolate Liqueur, poured into a chocolate rimmed glass with a mini candy cane. The Naughty but Nice features hot chocolate, Godiva White Chocolate Liqueur, vanilla syrup and shaved milk chocolate. Stay up late with the Christmas Coffee, espresso, Bailey’s Irish Cream, and Jameson Whiskey in a powdered candy cane rimmed coffee cup with a candy cane stirrer. Enjoy Santa’s Treat, featuring Navan vanilla cognac, Frangelico, Amaretto and a cinnamon stick. All drink specials featured during the holidays at Glen Prairie are $8. Stop in on New Year’s Eve and sample Glen Prairie’s New Year’s Drink specials including the French Toast, a creative cocktail featuring champagne, Hennessy, simple syrup and a splash of lemon juice. There is also the New Year’s Punch, made of Midori, Chambord, Absolut Raz, orange juice, a splash of sour and Grenadine, and topped with an orange wheel and cherry. Sip the Fresh Start, a refreshing mix of Brandy, champagne, orange juice, port and mint leaves. Glen Prairie Local Flavor Fine Food & Drink is located at 1250 Roosevelt Rd. in Glen Ellyn, Ill. in Chicago’s western suburbs. Glen Prairie is open from 6 a.m. until 10 p.m. Monday through Thursday, from 6 a.m. to 11 p.m. Friday, from 7 a.m. to 11 p.m. Saturday and 7 a.m. until 10 p.m. Sunday. The lounge remains open one hour later than the restaurant each day. For more details, contact the restaurant at (630) 613-1250. Treat family and loved ones to the special holiday menu at the pan-Asian paradise Karma, which offers its holiday menu, in addition to its regularly offered menu, from noon until 10 p.m. December 24 and 25. Price of the entrée includes the house salad and dessert. The three-course menu includes the Karma House Salad, and the choice of one of the following entrees: Szechwan Pepper Crusted Prime Rib of Beef served with ginger au jus ($28); Tempura Prawns served with a smoked pepper cream sauce, jasmine rice and baby bok choy ($26); Traditional Roast Turkey Breast and Gravy with wasabi mashed potatoes, stuffing, homemade cranberry relish and baby vegetables ($24); or Hoisin Glazed Rack of Lamb served with baby vegetables and a sweet potato soufflé ($35). Tempt the sweet tooth with Karma’s dessert specials including the Banana, Chocolate & Coconut Eggrolls, served with a ginger cinnamon sauce or Trio of Sorbet or Ice Cream, in addition to the regular dessert menu. Before or following the meal, relax in Karma’s chic lounge with White Christmas Martini, Stoli vanilla, Godiva white chocolate and peppermint Schnapps ($8). Ring in 2009 with Karma’s special New Year’s Eve menu, offered on December 31 from noon until 10 p.m. in the restaurant, and 1 a.m. in the lounge. The four-course menu includes a starter, intermezzo, entrée and a dessert. The cost of the entrée covers the entire meal. For starters, enjoy Carrot Ginger Dressed Field Greens, followed by an intermezzo of Tangerine Sorbet, and for dessert, Banana, Chocolate & Coconut Eggrolls with ginger cinnamon sauce. Karma’s regular dessert menu will also be available, and a complimentary glass of sparkling wine is included with each entrée. For New Year’s Eve entrees, choose between Grilled Marinated Lamb Chops, purple plum chutney, anise sweet potatoes and wilted Swiss chard ($36); 24 oz. Porterhouse, Thai basil wasabi mashed potatoes, wok tossed Brussels sprouts and Shanghai sauce ($40); Asian BBQ Striped Bass, over steam baby bok choy, shiitake mushrooms, Napa cabbage and sweet potato straws ($32); Five Spice Chicken, Jasmine rice, baby vegetables and crispy onions ($28). Indulge in Karma’s rich holiday drinks, offered now through January 31. Try Nutty Cake, Amaretto, Frangelico and coffee, topped with whipped cream ($8); Coco Beach, Malibu with hot chocolate, topped with whipped cream ($8); Karma B-52, Kahlua, Bailey’s, Amaretto and coffee topped with whipped cream; or Turtle Pie, hot chocolate, Bailey’s and Butterscotch Schnapps, topped with whipped cream. Chinese New Year begins on January 26, 2009, and Karma Asian Food and Wine is offering their special Chinese New Year menu in addition to their standard menus from January 26 through January 31, during both lunch and dinner service. Enjoy “Prosperity” Crispy Fried Golden Pork Won Ton, a flavorful combination of ground pork, Napa cabbage and ginger served with a Spicy Yuzu dip ($9); “Long Life” Szechwan Shrimp with Chili Sauce, wok tossed shrimp and asparagus flavored with Thai chilies and roasted peanuts in a rich glaze ($11); “Having Many Children” Chinese Greens and Noodles, stir fried mustard greens atop Chinese noodles seasoned with soy, sesame and black sesame seeds. “Happiness” Lobster in a Sweet and Spicy Sauce, wok fried and served with garlic chive jasmine rice, ($40); and “Long Life” Firecracker Beef, thinly sliced beef tenderloin, lightly dredged in seasonings then quickly sautéed with baby vegetables and sugar snap peas, served with black forbidden rice, ($27). Finish off the Chinese New Year meal with the tangy and tart “Luck” Tangerine Crème Brule ($8). Karma’s children’s menu is also offered for $5.95 for children ages 12 and under. Reservations are recommended. Karma is open seven days a week 6:30 a.m.-10 a.m. for breakfast; 11:30 a.m.-2 p.m. for lunch; 5 p.m.-10 p.m. Sunday through Thursday for dinner, and 5 p.m.-11 p.m. Friday and Saturday for dinner. The lounge is open 5 p.m.-11 p.m. Sunday through Thursday; and 5 p.m. - midnight Friday and Saturday. Karma is located adjacent to the Crowne Plaza Chicago North Shore at 510 East Route 83, Mundelein, IL 60060. For reservations or more information, call Karma at (847) 970-6900 or visit http://www.karmachicago.com/. 733 W Madison St, Chicago, Ill. The beloved Potato Latke will be complimentary to ordering customers, at the certifiably Kosher MetroKlub Gourmet Kosher Business Lunch, from 11 a.m. through 3 p.m., Monday through Thursday, December 15 through December 31, excluding December 24 and December 25 (MetroKlub will be closed for these dates). In addition to their fantastic lunch menu, including soups, salads, sandwiches and desserts, customers can bite into the crispy and comforting Potato Latkes, and enjoy them with their traditional accompaniment, applesauce. They will be served as a special holiday treat in addition to the standard MetroKlub Gourmet Kosher Business Lunch Menu. MetroKlub is open Monday through Thursday, from 11 a.m. to 3 p.m. happily serving lunchtime crowds. Reservations are strongly recommended, although take-out, delivery and catering options are also available. For more information about MetroKlub or to make a reservation, please call (312) 602-2104. The 47th Annual CARQUEST World of Wheels, presented by South Oak Dodge-Chrysler-Jeep, will take place January 23-25, 2009 at Chicago's McCormick Place - Lakeside, (2301 S. Lakeshore Drive, Chicago, Ill.). Friday hours are: 3 p.m. until 10:30 p.m.; Saturday, 10 a.m. until 10:30 p.m.; and Sunday, 10 a.m. until 7 p.m. A $16 admission cost per person ($5 for children under 12 years of age) will open the doors for one of the most action-packed weekends in Chicago. 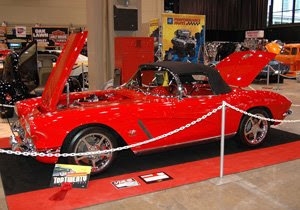 Celebrating its 47th year in showcasing the country's best cars and motorcycles, CARQUEST World of Wheels will be exhibiting more than 400 of the country's most spectacular customized cars, as well as more than 100 of the nation's best custom built motorcycles in the "Cyclerama" exhibit. Nearly 345,000 square feet of exhibition space within McCormick Place Convention Center will be used to its fullest, as thousands of car enthusiasts will visit the convention center over the course of its three-day run. CARQUEST World of Wheels is a three-day experience, full of displays and events, including a live charity auction featuring auto and music memorabilia, vendors, demonstrations and showcases. "There will be a wide variety of automobiles and motorcycles," says show co-manager Bob Ashton, "ranging from local hobbyists bringing in their "pride and joy" to national magazine cover cars, street rods and muscle cars to race cars." From the "Rod 'N Custom 62" showcase featuring a well-chosen mix of traditional hot rods and customs, to educational displays aimed towards the young generation of car enthusiasts, CARQUEST World of Wheels will be a weekend to remember. One of the highlights of the weekend will be the Legends of Motorsports Guild "Lifetime Achievement Award" Induction Ceremony, taking place on Saturday January 24, 2009 at 10 a.m. This ceremony will be celebrated with a brunch, and will honor exceptional individuals who have made an unforgettable impression, both locally and nationally, in the world of Motorsports. The awards are organized within three categories: Design/Manufacturing, Racing and Media. 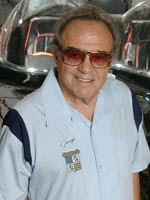 This year, the Legends of Motorsports Guild will honor George Barris, the "King of the Kustomizers"; Ron Colson, NHRA Hall of Fame Drag Racer; and Paul Brian, WLS Radio Motorsports announcer. After celebrating Barris' "Lifetime Achievement" induction, patrons can see his famous pop culture cars on display. Check out TV's Batmobile from the original "Batman" series starring Adam West; the original 1980's K.I.T.T. Firebird from TV's "Knight Rider"; the Monkee Mobile from TV's "The Monkees" (with an appearance by original Monkee, Mickey Dolenz); and the Drag-U-La from TV's "The Munsters." Pop culture stars, Wolf and Venom of TV's "American Gladiators," will also be present to rile up the crowds. Throughout the weekend, cars will compete for the prestigious Legend Cup, sponsored by CleanTools. This award will be given to the winning vehicle which best represents a combination of style, quality and craftsmanship during the CARQUEST World of Wheels weekend. An advisory board will choose the "Top Twenty" vehicles that best represent the CARQUEST World of Wheels, from which a select six vehicles will be chosen to advance in the competition for the esteemed Legend Cup. The introduction of the "Select Six" will be announced during the "Legends of Motorsports" brunch. The winner of the CleanTools Legend Cup will be awarded a beautiful perennial cup and presented with a check for $5,000. CARQUEST World of Wheels patrons can expect to see much more than automobiles-the "Cyclerama" exhibit, presented by Oak Lawn Harley-Davidson, will fill the ballroom area of McCormick Place - Lakeside with customized motorcycles, motorcycle-specific vendors, star cycle-customizers, and celebrities. Committed to educating future generations about the automotive industry, the 4th Annual CARQUEST World of Wheels Student Career Day will be held Friday, January 23, 2009 starting at 9 a.m. at McCormick Place - Lakeside. Participating students will have the chance to visit the CARQUEST World of Wheels show floor to see the vehicles and speak with sponsors and exhibitors before the event opens to the public. They will also be able to register for prizes like welders from Student Career Day sponsor, Miller Welding, participate in interactive exhibits and meet with human resource representatives from automotive related companies looking to hire interested young men and women. CARQUEST World of Wheels is hoping to combine the worlds of auto and art with the Chicago Brush Masters Pinstripers Art Auction. This live auction will feature more than 300 professionally decorated pieces from artists from around the country. "All of the items offered are one-of-a-kind works painted by volunteer artists," explains Bob Ashton. Not only will their work be available for bidding, but artists will be on site all weekend, painting during open show hours. Sightseeing is only half the fun of CARQUEST World of Wheels showcase when there is much shopping to do. A wide assortment of vendors will be exhibiting, offering the latest in car customization, technology and accessories, such as GM Performance Parts, Meguiar's and UCoat-It. The 47th Annual CARQUEST World of Wheels, presented by South Oak Dodge-Chrysler-Jeep is produced by Championship Auto Shows, Inc. of Auburn Hills, Mich. Part of the GM Performance Parts Show Car Series and the International Show Car Association custom car competition, the show will take place January 23-25, 2009 at McCormick Place - Lakeside, (2301 S. Lakeshore Dr.; Chicago, Ill.). The event hours are Friday, 3 p.m. to 10:30 p.m., Saturday, 10 a.m. to 10:30 p.m. and Sunday, 10 a.m. to 7 p.m. For more information, call (708) 361-2665 and visit the World of Wheels website at http://www.worldofwheels.com/. A Silver Lining Foundation recently celebrated a milestone-- the 500th ASLF-funded mammogram given at The University of Illinois Medical Center at Chicago (UIMCC). Chicago resident Charlene Dodson was the lucky recipient on Friday, November 21 at UIMCC. ASLF provides no cost screening mammograms, follow-up diagnostic testing, and other breast cancer resources to uninsured and underinsured patients. The foundation's Buy A Mom A Mammogram program funds screening mammograms at area hospitals to qualifying women in a timely, dignified and respectful manner. "We celebrate this incredible milestone in honor of women like Charlene Dodson, who have benefited from our resources, and always have our unconditional support," said Dr. Sandy Goldberg, breast cancer survivor and ASLF founder. "We're fortunate to have our friends at UIMCC provide their time, and services for 500 mammograms (and counting)!" And don't forget to celebrate the holidays with ASLF! Make sure your name is on Santa's list of "Nice" rather than "Naughty" by joining ASLF's Junior Board for the "Save the Girls Holiday Party" at Zella (1983 N. Clybourn Ave., Chicago; 773-549-2910) on Friday, December 5 at 8:30 p.m.
"Save the Girls Holiday Party" will raise money to support Buy A Mom A Mammogram. 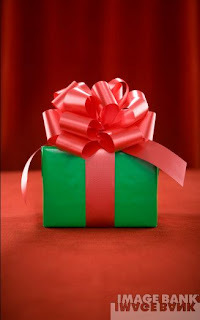 Is there a better gift to give during the holidays? While the December temperatures drop, you'll be enjoying the all-you-can-eat, all-you-can-drink party in a heated tent on Zella's outdoor patio. Advance tickets are $35, and can be purchased online at www.asilverliningfoundation.org/tickets, with $40 admission at the door. All attendees will receive a raffle ticket for prizes like sporting tickets, mountain bikes, and much more. For more information on ASLF, visit http://www.asilverliningfoundation.org/. FIESTA…FIESTA…FIESTA…Adobo Grill is THE place to have your event. Adobo Grill offers authentic regional Mexican cuisine using traditional cooking methods and the freshest ingredients with over 80+ tequilas. Adobo Grill offers you two locations in the city to plan your perfect event. With an interior of exposed brick, Diego Rivera-inspired paintings, warm earth tones and unique special from our wood-burning oven, Adobo Grill creates a festive, fun and inviting atmosphere with friendly, attentive staff. Choose from a variety of rooms, including a room showcasing a fireplace and skylights. Customize your special menu with a selection of diverse menus to choose from; whether it`s 20 to 200, we have the space for you. Adobo Grill has expanded to the western suburbs in Lombard. Please come check us out if you are in the neighborhood. This new Adobo Grill is located in the Shops on Butterfield at Yorktown Shopping Center and will have 3 private party spaces to choose from. 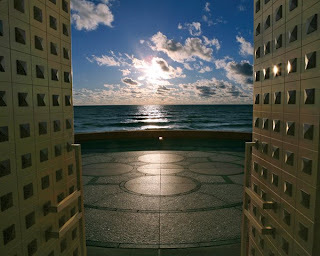 With our two unique campuses, Loyola University Chicago is one of the premier conference and event facilities on a college campus, and in Chicago. Our extraordinary settings make for an unparalleled meeting and event destination. Urban energy infuses our downtown Water Tower campus, which is located on Chicago’s Magnificent Mile, while our stunning Lake Shore campus is located on the shoreline of Lake Michigan. Such diverse, yet integrated settings create a vibrant destination. A dedicated catering manager, and our wonderful team of chefs will take the guesswork out of planning a corporate meeting, cocktail reception, wedding or awards banquet. Our catering staff includes world-renowned chefs who will coordinate anything from an intimate breakfast, to a deluxe banquet. Our catering team will help select menus, and manage seating arrangements. We provide the finest cuisine along with the perfect setting, to ensure that your meeting is a success. 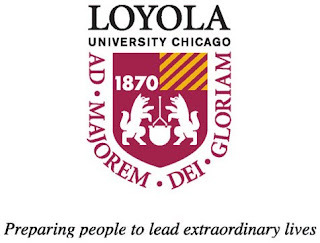 To schedule your next event with with Loyola University Chicago, please contact Mary Cashman at mcashm2@luc.edu, or (773) 508-8069. For more information about our services, please visit our Web site at http://LUC.edu/conference. Chef-owned Cyrano’s, in the heart of River North, in the art gallery district, is a truly warm and authentic French restaurant that has been serving festive, passionate, candlelit dining for 12 years. Didier Durand is a highly acclaimed chef, staying true to his commitment to the purity of French cuisine with heavenly focused and balanced flavors. His wife, wine cellar master Jamie Pellar, brings to you her portfolio of reasonably priced wine gems that are unique to complement your menu, be it a multi-course degustation dinner, gourmet lunch, dinner buffet, or cocktail reception. 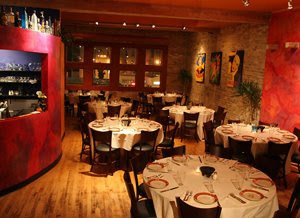 Cyrano’s has two floors and three distinct areas for private parties . 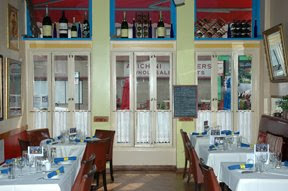 Together, with their dedicated staff, they pride themselves on intimate service in a charming atmosphere. We have a piano on premise and the Café Simone area can easily be transformed into a cabaret for a fun evening! We cater to parties of every size, from weddings, to large corporate events, holiday parties, and bar and bat mitzvahs. January is the new December at 10pin bowling lounge, so you can keep the holiday celebrations rolling into the new year! Whether you’re planning a small outing or a full house up to 250 people, 10pin will be right up your alley. 10pin redefines the bowling experience by combining a retro sport with a hip upscale lounge. 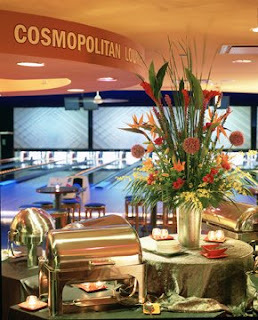 With a decidedly upscale atmosphere, we pair bowling, martinis and an extensive menu selection to create Chicago’s premier event venue. Twenty four state-of-the-art lanes, topped by eight high-definition video screens, an advanced audio system and revolutionary video jukebox contribute to 10pin’s twenty thousand square feet of high energy entertainment and makes 10pin the perfect setting for your holiday celebration! For more information Call 312.644.0100 or visit http://www.10pinchicago.com/ Remember, no matter what time of year it is, there is always an excuse for a party! Dreading the long list of holiday gifts you have to buy? Does your gift shopping list keep getting longer and longer? Avoid the crowds and hassles of Black Friday, and shop online at CharityBlast.com, a website that provides exceptional discounts at online stores. The best part? CharityBlast donates up to 30% of your purchase to the charity of your choice-- in this case, A Silver Lining Foundation (ASLF). ASLF's mission is to ensure dignified, respectful and equal access to quality cancer education and services for all, by creating meaningful partnerships with community, advocacy and healthcare organizations. ASLF gives gifts year-round through its Buy A Mom A Mammogram program, which provides no-cost breast cancer screening mammograms to underinsured and uninsured patients. CharityBlast gives discounts at online stores like Barnes & Noble, Best Buy, Dell, Delta Airlines, Harry & David, Macy's, Old Navy, Staples, The Body Shop, Travelocity and more. That can cover just about anyone on any list. Santa, if you're reading this, take note. Use this special link to shop for ASLF on CharityBlast. ASLF has given back-- now it's time to give back to ASLF. And it's just a few mouseclicks away. No crowded mall parking lots for you! For more information on ASLF, please visit www.asilverliningfoundation.org. It was by accident that we met. Or was it? A spiritual woman who had prophetic nightmares of the impending airplane dissaster that killed Buddy Holly, Richie Valens and The Big Bopper, may beg to differ. I had just spotted a guy wearing a Carroll Shelby jacket. In a sea of Chevrolets, I figured that the guy had guts, and he must have had something to do with my old friend Shelby. (I was on the public relations team that launched the Shelby Daytona for Dodge in the early 80s). Jerry Heasley, the Shelby jacket wearing guy, was a West Texan like Peggy Sue; they were friends. He had just released his beautiful tabletop book on the Mustang. A photo journalist and author, Jerry's books set themselves apart from car company produced books as they are personnal accounts, and behind the scene photo essays. He was at the Vettefest to promote his Corvette book and slipped in a copy of the Mustang one alongside. For me, it was memory lane. Many of the people he wrote about were friends and business collegues of mine from my 14-year auto industry stint. (I spent four years at Crain Communication's Automotive News and 10 years with Chrysler Corp. public relations). Jerry and Peggy Sue were sharing booth space. It was like a past life experience for both Lee and I. Lee began his early career as a guitarist. It was a simplier time before BU and Northwestern. He and childhood friend Steve "Funkytown" Greenberg played in many bands, touring the midwest circuit, playing dance halls, much like the ones played by Buddy Holly. I was a band promoter during college and later worked with music sponsorshipsand promotion at Chrysler. My first independent pr gig was working for the band The Association (Cherish, Windy, Never My Love, Along Comes Mary). And now, years later, we were back talking about music, life on the road and cars. We called Steve so he could chat with Peggy Sue. 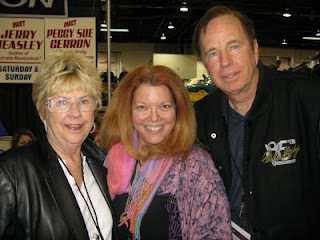 I don't know who was more excited, Peggy Sue for meeting the guy who wrote and performed the one hit wonder "Funkytown," or Steve who was touched by the woman immortalized by one of Rock 'n Roll's most significant icons. Whichever, it was a fantastic evening down memory lane. Appropriate today, perhaps more than ever, The Chevy Vettefest is a celebration of a time when people had a love affair with the American automobile. It made sense to have Peggy Sue there, to tell her story and represent the person that changed American pop music history forever. And for those who lived it, a chance to recount the 50 years that have passed since that fatefilled night. High school good friend of Kurman Communications, Inc. President Cindy Kurman, Gail Klingensmith, can be proud to say that she's served pancakes to the future President of the United State of America, Barack Obama. Klingensmith is part of the ownership team behind Pamela's, a popular diner with multiple locations in Pittsburgh. 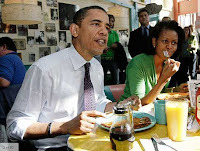 their healthy eating and wide-ranging palates, the Obamas were big fans of the pancakes and atmosphere that welcomed them at Pamela's. This week, the AP published a story covering this "first family of foodies," detailing their local Chicago favorites like Topolobampo and Spiaggia. For the entire article, press here. Mexican food, pancakes, Italian dining... what type of food will the Obamas ask for in The White House? We hear that Art Smith has already setup shop in DC. Will Rick Bayless, Tony Mantuano and the Gail / Pamela duo follow? Still deciding what do this weekend? 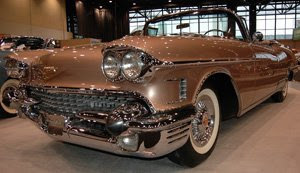 Stay out of the cold, and head to the Nickey Chicago Chevy Vettefest this Saturday and Sunday at the Donald E. Stephens Convention Center in Rosemont, Ill. The WGN Morning News' Around Town reporter, Ana Belaval, showed viewers a sneak peek of the show (the largest All-Indoor, All-Chevy show/swap meet in the country). See these and other Chevys and Corvettes this Saturday and Sunday, November 22 and 23 (Saturday, 9 a.m. to 8 p.m., and Sunday, 9 a.m. to 4 p.m.). Tickets are $15 for adults, children 12 and under are free. Visit www.chevyvettefest.net for more information. Several local car owners showed off their collectible Chevys and Corvettes during the WGN 9 midday news today to promote the Nickey Chicago Chevy Vettefest, presented by Bill Stasek Chevrolet, happening this Saturday and Sunday, November 22 and 23 at the Donald E. Stephens Convention Center in Rosemont, IL. Nickey Chicago CEO, Stefano Bimbi showed WGN's Steve Baskerville an award-winning '94Red Corvette Coupe, a '96 Corvette Grand Sport, a 1,000 Horsepower Red Camaro (one-of-its kind) and a '69 Z/28, which will be showcased in a special sYc Supercar Showcase of '69 Z/28's that will represent all 18 available colors! Also on hand were a '71 Steel Cities Gray LS6 which will be a part of the Triple Crown Gallery at the Vettefest, an original '70 Nova, a '68 Chevelle Drag Racer and a Yenko Junior Drag Racer. The Nickey Chicago Chevy Vettefest is the largest all-Chevy, all-indoor show and swap meet in the country with more than 400 of the country's best Chevys and Corvettes. See cars like these this Saturday, 9 a.m. to 8 p.m. and Sunday, 9 a.m. to 4 p.m. Tickets are $15/adults (children 12 and under are free). Don't forget discounted tickets are available for just $10 through Thursday, ONLY at Bill Stasek Chevrolet (700 W. Dundee Rd., Wheeling, IL; 877-806-0997). Birch River Grill - An American Kitchen celebrates Thanksgiving with its pre-fixe, offered November 27 from noon until 7 p.m. Enjoy Acorn Squash and Kentucky Bourbon Bisque; Autumn Salad, with mulled wine poached pear crumbled bleu cheese, toasted pecans and kiln dried cherry dressing; Maple Glazed Free Range Turkey Breast, with Granny Apple sausage cornbread stuffing, sage pan gravy, buttermilk mashed Yukon Gold potatoes, brown butter green beans and rustic cranberry-orange relish; and finally, Spiced Pumpkin Pie, served with cinnamon whipped cream. The meal is $24.95 per person, and $13.95 for children 12 and under. Birch River Grill - An American Kitchen is open for breakfast, lunch and dinner seven days a week, from 6 a.m. to 10 p.m. Monday through Thursday; 6 a.m. to 11 p.m. Friday; 7 a.m. to 11 p.m. Saturday; and 7 a.m. to 10 p.m. Sunday. The lounge stays open one hour later daily. All major credit cards are accepted. Complimentary parking is available. For reservations or more information, please contact Birch River Grill - An American Kitchen at (847) 427-4242 or visit them on the web at www.birchrivergrill.com. Chicago's chic, retro-themed Dine celebrates Thanksgiving with a special pre-fixe Thanksgiving menu, offered November 27 from 4 p.m. until 10 p.m. Enjoy Roasted Acorn Squash Soup, with brown butter and sage, or Fall Greens, with buckwheat honey roasted pears and cider vinaigrette for starters. For the main course, feast on Sage Rubbed Turkey Breast, with andouille sausage cornbread stuffing, roasted green beans and caramelized shallot gravy. Satisfy the sweet tooth with Pumpkin Cheesecake, with pecan crust and cinnamon ice cream. The meal is $28.95 per person; $16.95 for children under 12. Dine is open for breakfast, lunch and dinner seven days a week. Breakfast is served from 6 a.m. to 10:30 a.m. Lunch and dinner are served from 11 a.m. to 10 p.m. Sunday through Thursday, and from 11 a.m. to 11 p.m. Friday and Saturday. The Martini Bar and Lounge is open until 11 p.m. Sunday through Thursday, and until midnight Friday and Saturday. Dining is available at the bar. Valet parking is complimentary. For more information or to make reservations, please contact Dine at (312) 602-2100 or visit www.dinerestaurant.com. 840 N. Wabash, Chicago, Ill. The Gold Coast's latest addition to the culinary scene, Eve, celebrates Thanksgiving with four unique, regionally-inspired menus. For North, enjoy a Slow Roasted Suckling Pig; a salad of Fennel, Heirloom Apples and Arugula; Baby Spinach Salad with Shiso Vinaigrette; Herb Roasted Heritage Turkey; Sausage and Black Walnut Stuffing, Sage Gravy; and Pumpkin Chocolate Bread Pudding with spiced cream. East's menu includes: Gorgonzola Broiled Oysters with applewood smoked bacon, pear and celery; Roasted Chestnut Bisque; Cranberry-Orange Sorbet; Grilled Breast of Heritage Turkey; Maine Lobster Croquettes, Brussels Sprouts, Pumpkin Puree; Cranberry Apple Crumble and Spearmint Ice Cream. The vegetarian West menu includes Chantrelle Mushroom Streudel with Maytag bleu cheese and cranberry-apple chutney; Tofu Tempura Baby Tat Soi Salad with shiso orange vinaigrette; Walla Walla Onion and Butternut Squash Muillefeuille; Tuscan Kale with piquillo peppers and date beurre blanc; and Cranberry-Orange Crumble Spearmint. The hearty South menu includes Turkey Crawfish Gumbo with pickled okra; Wilted Frisee and Fried Green Tomato Poached Egg with Virginia ham and cranberry vinaigrette; Grilled Quail; Smoked Cheddar Grits; and Chocolate Pecan Tart with bourbon Anglaise. 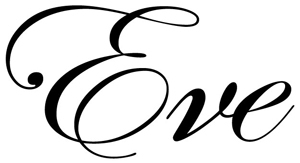 Eve's Thanksgiving menus are available November 27 from noon until 7 p.m. for $55 per person. Reservations are required. 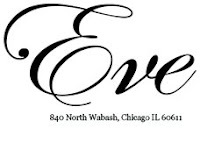 Eve is located at 840 N. Wabash in Chicago. Eve is open Monday through Friday from 11 a.m. until 10 p.m.; Saturday from 5 p.m. until 11 p.m., and Sunday from 10 a.m. until 10 p.m. For reservations and more information, call (312) 266-3383 or visit www.evechicago.com. With the intent to promote environmentally sustainable practices, Glen Prairie - Fine Food & Drink, does just that with its pre-fixe Thanksgiving dinner. The five-course menu highlights the Midwest's bountiful culinary offerings, with one choice of appetizer, soup, salad, entrée, and dessert. For an appetizer, try Crab Corn Pudding, Grilled Roasted Vegetable Polenta with portabella red wine ragout or Cast Iron Skillet Cornbread. For soup, try Pumpkin and Shrimp Bisque, or Heirloom Beet Soup served in roasted acorn squash. Salad selections include Cranberry Waldorf, with red and green apples, raisings, walnuts and cranberry vinaigrette, or Arugula Salad with oranges, pomegranate seeds, herbed goat cheese and citrus vinaigrette. Entrée selections include Grilled Free Range Turkey Tenderloin topped with roasted dark meat served with cornbread stuffing, maple roasted acorn squash and cranberry-orange relish; Lamb Bolognese, with roasted cherry tomatoes, pappardelle pasta and fresh basil; Pumpkin Goulash, lentils, vegetable broth and brown rice or Macadamia Nut Crusted Wisconsin Trout, served with Minnesota wild rice, caramelized apples, sautéed green beans and Champagne saffron sauce. Finally, choose from Brioche, Bing Cherry Bread Pudding, Pumpkin Cheesecake with caramel sauce, or Grandma's Chocolate Cake. Glen Prairie's Thanksgiving feast is $42 per person. Glen Prairie is located at 1250 Roosevelt Rd. in Glen Ellyn, Ill. in Chicago's western suburbs. Glen Prairie is open from 6 a.m. until 10 p.m. Monday through Thursday, from 6 a.m. to 11 p.m. Friday, from 7 a.m. to 11 p.m. Saturday and 7 a.m. until 10 p.m. Sunday. The lounge remains open one hour later than the restaurant each day. For more details, contact the restaurant at (630) 613-1250. 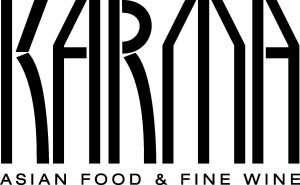 Karma-Asian Food & Wine has prepared a Thanksgiving feast with its pre-fixe Thanksgiving menu, offered November 27 from noon until 10 p.m. Served family style, the menu consists of: House Salad, Fresh Fruit Salad, Gingered Butternut Squash Soup, Slice Roast Turkey Breast with Gravy, Red Skin Mashed or Sweet Potato Mashed, Grilled Asparagus with roasted red peppers, Green Bean Casserole, Homemade Cranberry Relish and Dinner Rolls. For dessert, choose between Apple Pie a la Mode or Pumpkin Pie . The meal is $19.95 for adults, $11.95 for children four to twelve years old, and complimentary for children three and under. (847) 970-6900 or visit www.karmachicago.com. 1 E. Delaware Pl., Chicago, Ill. Looking for something more this holiday season? Chicago's new upscale cupcake boutique, MORE, known for its creative sweet and savory cupcakes, has introduced a variety of new, unique cupcake flavors that are sure to help make holiday celebrations so much more. MORE offers a rotating selection of daily flavors, including new flavors like Sweet Potato, Thanksgiving, Banana Spiced Rum and Cranberry. Cupcakes range from $3.50-$4.25/each, $39.50-$49.50/dozen. Looking for party favors or that perfect hostess gift? MORE offers a variety of cupcake flights with six of its MOREsels, mini cupcakes, including a special Holiday Flight with flavors like Gingerbread, Chocolate Mint, Peppermint White Chocolate and their deliciously infamous Red Velvet. MORE also has a new Wine and Cheese Flight with flavors like Camembert Sauternes, Apple Gorgonzola, Champagne Brie and Pear, Blue Cheese and Port. MORE also offers flights with sweet or savory MOREsel flavors each day. All flights range from $9.50-$11.50/each. To make the perfect holiday party appetizer or dessert, MOREsels are also available by special pre-order in sets of 16 or 30. Please note orders required a minimum of 48-hours notice. To place an order for cupcakes, please contact MORE at (312) 951-0001. 4539 N. Lincoln Ave., Chicago, Ill.
Visit the chic Tallulah in Chicago's Lincoln Square neighborhood for their special pre-fixe Thanksgiving menu. The four-course dinner includes Heritage Roasted Turkey with jalapeno-cheddar dauphinoise, Buttered Baby Turnips, Boar Bacon Gravy, and Seared Duck Breast with cranberry rillettes and tartine, Miners lettuce and orange vinaigrette. This Thanksgiving menu is offered on November 27 from noon until 6 p.m. and costs $45 per person. Reservations are required. Tallulah is open for dinner Tuesday through Sunday from 5 p.m. until 11 p.m. and open for brunch on Sunday from 11 a.m. until 3 p.m. Tallulah is located at 4539 N. Lincoln Ave. in Chicago. For reservations and more information, call (773) 942-7585 or visit www.tallulahchicago.com.